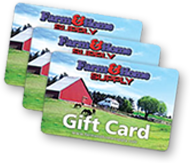 Farm and Home Supply is your local, family-owned alternative to big box chains for tools and hardware. We still sell bolts, nuts, nails, and washers by each weight. We stock generators, compressors, power tools, hand tools, tool storage, plumbing and electrical, pain, concrete and driveway, and mailboxes and signage. We also have a huge welding department with welders, tools, safety gear, and abrasives. While we do carry discount tool brands like King Tool we have major brands in-house: DeWalt, Milwaukee, ChannelLock, Craftsman, Estwing, Lincoln, Hobart, Pro-Grade, Stanley, and Work Sharp. Farm and Home Supply also stocks equipment from Quincy Compressor, Powermate, Honda, KT Industries, Champion Power, Majic, Rustoleum, Klean Strip, Quikrete, Homak, Montezuma, HIllman, and Keter. Farm and Home Supply does not carry lumber, boards, or sheeting but does have plexiglass and PVC tubing. We also have step ladders, bulk chain, and bulk rope.